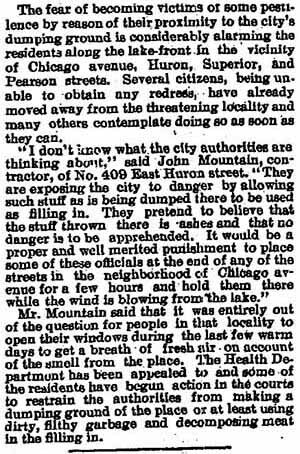 “I have just moved into a house at 444 Chestnut street, near Lincoln Park boulevard, and I have there to suffer a most odious smell coming from the dumps northeast of Chestnut street. Physicians who visited me were astounded and declare the conditions so unhealthy that they believed your attention ought to be called to this. 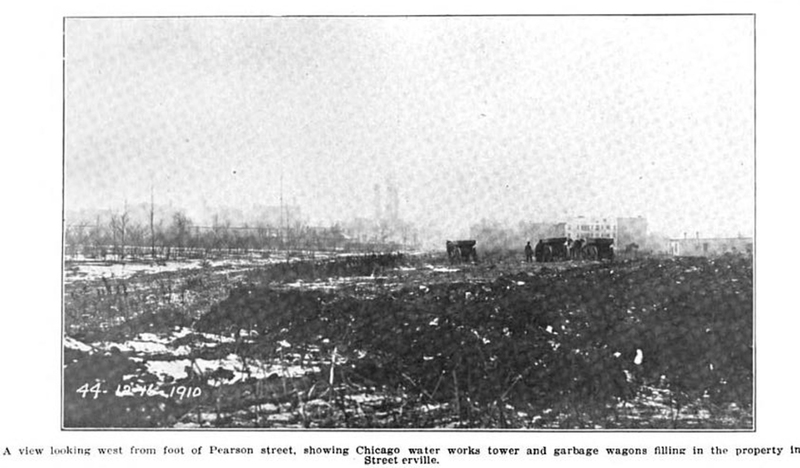 Inspector William J. Doherty made an investigation of the conditions and reported them insanitary and “foul.” Garbage from the Twenty-first, Twenty-second, and Twenty-third wards is dumped within a short distance from the homes of some of Chicago’s wealthiest citizens. Former Ald. John M. Gilder is said to have charge of the dumping of the garbage. Adrian Honore, 204 Dearborn street; clay holes at Oak and Pearson streets. H.H. Cooper, 100 Washington street; agent for property owner at Walton and Delaware place, where there are two clay holes, and Chestnut street from the end of the Palmer estate to the lake. Hills Brothers, 100 Washington street, Delaware place and Lafayette cort. Minnie Allmendinger, Addison street and Wilton avenue, three clay holes at Walton place and Delaware place. Newberry library, property between Huron, and Erie streets, and at the end of Superior street. Mrs. DeWitt C. Cregier, property at Chicago avenue and Lafayette court. Ogden-Sheldon company, property between Ontario and Ohio streets, Illinois street and the lake. 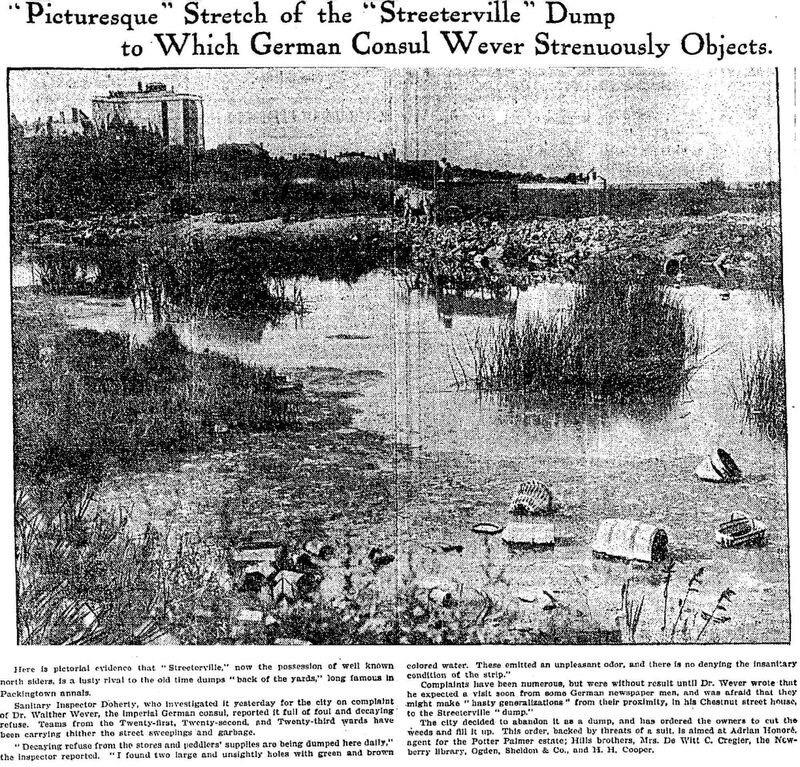 More than ten years before the German Consul took action in the topmost Tribune article on this page, people were complaining about the smell of garbage being dumped in Streeterville along the lakeshore. The article, below, addresses the ground filling within Block 21. A subinspector was charged with taking a toll of 25¢ per load of garbage at this area between Chicago Avenue and Pearson Street. 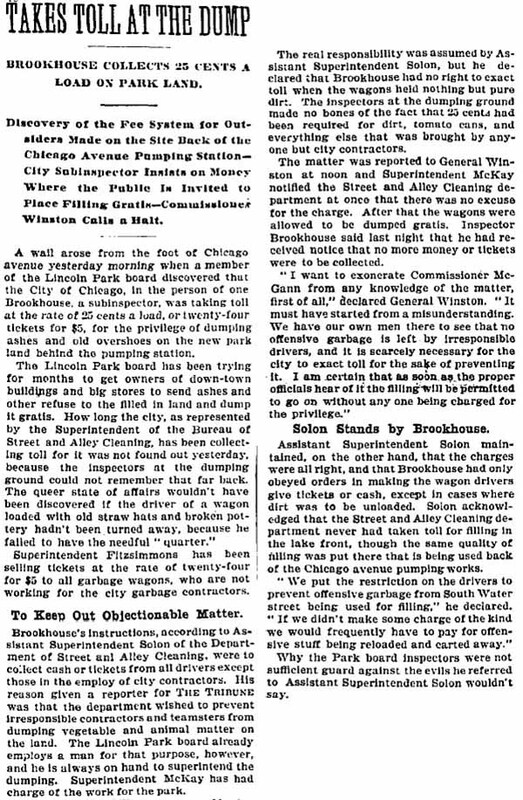 The article notes that the Lincoln Park Commissioners had been "trying for months to get owners of down-town buildings and big stores to send ashes and other refuse to the filled in land and dump it gratis." Also, "The queer state of affairs wouldn't have been discovered if the driver of a wagon loaded with old straw hats and broken pottery hadn't been turned away, because he failed to have the needful "quarter."